Rewards Debit Cards Are Coming Back: Should You Opt For Debit Over Credit? When it comes to shopping, our lives are full of an almost endless series of decisions. It’s no wonder so many of us are stressed out! And the choices don’t stop when we’re ready to pay for the items we’ve finally decided to purchase. This is because one of the most confusing options we have is which type of plastic we’re going to use to buy our stuff: credit or debit? If you like rewards, the obvious choice used to be credit. But now that debit card rewards programs are coming back, it’s become tougher to decide. If you’re feeling anxious about how to pay, take a look at the information below to see where debit cards stand today – and how you should proceed when it comes time to check out. Prior to the financial downturn of 2008, debit cards were an easy way for banks to make money. Many of those revenues came from overdraft and swipe fees. But the profits party started grinding to a halt in 2010, when the Federal Reserve passed new regulations that limited banks’ ability to collect money from overdraft fees. In 2011, swipe fees on debit card transactions were capped. 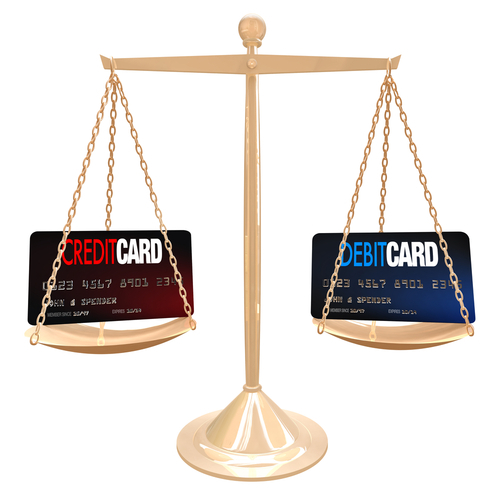 Some people expected that debit cards would be phased out due to lack of profitability. However, these predictions didn’t turn out to be accurate. Debit cards are regaining popularity, and this up-tick is being spurred by banks, many of which are looking to make up for profits lost on fees by increasing the number of debit cards in use. Direct mail marketing for debit cards has increased 6% since 2011, and Internet marketing is also on the upswing. Generally, banks are targeting millennials in their efforts to make debit cards as profitable as possible. Research shows that young Americans are forgoing credit cards in large numbers, which may be due to concerns over getting into debt. Debit cards offer a convenient alternative to credit cards without putting the user at risk of overspending or getting into trouble with interest charges. Between the inherent benefits that debit cards offer for debt-conscious consumers and the marketing push from banks, debit is back on the scene in a big way. In order to compete with the rewards programs offered by their credit counterparts, debit card issuers are also bringing back debit card rewards programs. However, debit card rewards are a little different than they used to be. Prior to the Dodd-Frank regulations, debit card rewards programs functioned very similarly to credit card rewards programs. Points were earned on purchases and could be redeemed for a variety uses, including travel. These days, though, debit rewards programs come in all shapes and sizes. Some checking accounts pay interest on your existing balance, while others waive ATM fees or lower monthly fees. Often, you’ll have to meet certain requirements like a minimum number of transactions or direct deposit. While the reintroduction of debit card rewards programs may make debit cards more attractive, it’s important to remember that debit cards have their limits in terms of their usefulness in your overall financial life. For one thing, if you like getting perks for the spending you’re already doing, debit doesn’t hold a candle to credit. While the new debit rewards programs offer discounts at some retailers, a good cash-back credit card will allow you to wrack up bonuses on every purchase you make. For example, the Capital One® Quicksilver® Cash Rewards Credit Card provides 1.5% cash back on every transaction, all the time. This is far beyond the rewards value you’d get with a debit card. Another important factor to consider is your credit score. Simply put, swiping your debit card won’t help you build credit, and building credit is essential if you ever want to be able to buy a home or a car. So while it’s true that using a debit card could help keep you out of debt, it also won’t allow you to move towards accomplishing other financial goals. The bottom line: debit cards are becoming popular again, and many are now offering rewards programs in an effort to compete with credit cards. However, there’s nothing wrong with mixing and matching if you’re a pro: as long as you’re careful to avoid fees, you can earn rewards on both credit and debit.